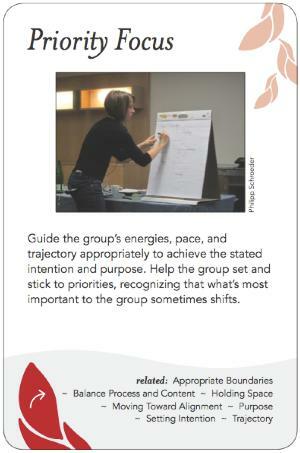 Guide the group's energies, pace, and trajectory appropriately to achieve the stated intention and purpose. Help the group set and stick to priorities, recognizing that what's most important to the group sometimes shifts. This is another pattern related to time management. It refers to the focusing of the group's attention on what needs to be their priorities in order to achieve their purpose and intention. This is an essential skill of facilitators to keep the event moving forwards at the right pace and not get sidetracked into tangents. The priorities of a group in an event are implicit, changing and emergent. While a facilitator may ask/invite the group to state their priorities explicitly, it is likely that any response will be incomplete and quickly obsolete, so it is necessary for the facilitator to continually intuit the group's priorities and, as needed, check in with the group and gently guide them back towards work that is in keeping with these priorities. Priorities may be set out at the outset, as part the group's stated purpose or intention. The facilitator must then regularly check in with the group to ensure that the pace and trajectory of the event is appropriate to achieving the purpose or intention, and keep the group on track by helping them set priorities on what to discuss and to do. There are many techniques that can help a group assess or reassess its priorities.